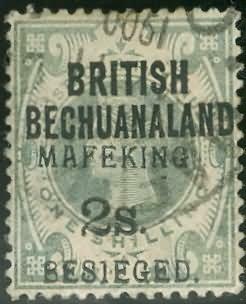 There are only three known examples of this stamp. The first was only discovered in 2003 after one was sent to the British Philatelic Association (BPA) as a normal 2s on 1s green with sans serif overprint. They concluded that it was indeed genuine but state in their certificate that it is of “undertermined status.” Due to this it is currently not catalogued by SG but mentioned (and priced at £38’000) in a footnote. 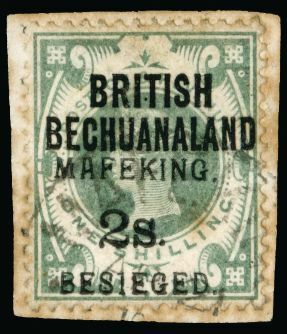 Following its discovery it was decided to seek further opinions and was sent to two leading students in the field of Mafeking Siege Stamps and Boer War philately. One of these specialists provided information that another example was offered in Auction in 1970 as a normal and also has a April 1900 cancel. The second consultant agreed it was genuine but probably an essay. 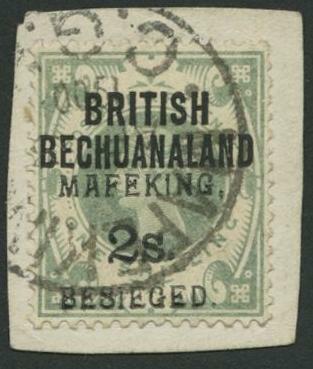 This could be correct as the British Bechuanaland 4d was surcharged 1s with both types of font as a double surcharge. This is a known practice of some jobbing printers of that era deliberately overprinting a subject twice with either different type or different inks.